"We have got used to believing that Alzheimer's is automatically a part of getting older, and it isn't"
The petition, which has been signed by 20,000 people, describes current level of funding as "appalling". The campaign is backed by more than 100 top scientists. The Discworld creator, diagnosed with a rare form of Alzheimer's disease this year, also met Prime Minister Gordon Brown and Health Minister Phil Hope. The petition, addressed to Mr Brown, highlights that Alzheimer's and related diseases, which affect 700,000 people in the UK, currently receives just 3% of research funding. 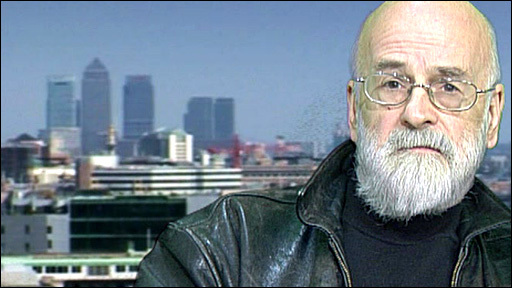 Mr Pratchett, 60, said: "We are facing, to use the term said to me by one of the leading US researchers, a worldwide tsunami of Alzheimer's and other dementia diseases. "There's only two ways it can go: researchers, with as much help you can give them, may come up with something that reduces the effects of this dreadful, inhuman disease, or we will have to face the consequences of our failure to prevent the final years of many of us being a long bad dream. "The strain on carers and their support is bad enough now; before very long the effects on the health service and society itself, will be unbearable." Following his hour-long meeting with Mr Brown, the author said: "We had a very long and frank meeting, and I have to say I was impressed. "The Prime Minister joined us and he clearly recognises that dementia is a huge problem." Rebecca Wood, chief executive of the Alzheimer's Research Trust, of which Mr Pratchett is a patron, said dementia cost the UK economy £17bn a year. "If scientists could work out how to delay the condition by five years, we could halve the number of people who die with dementia. "The support from across the political spectrum for an increase in dementia research funding is overwhelming; what other issue unites petition signatories like Lord Rees-Mogg and Tony Benn? "The prime minister must take radical action, and fast." The Department of Health said the forthcoming national dementia strategy would set out plans to speed up diagnosis, and improve patient care. It also pledged to increase investment in dementia research, which it said had already been boosted.